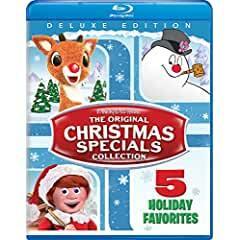 Five of some of the most timeless holiday films come together on Blu-ray™ and DVD in The Original Christmas Specials Collection: Deluxe Edition available now from Universal Pictures Home Entertainment. Featuring all-new bonus features and unforgettable characters, experience these five classic holiday specials with your whole family. ‘Tis the season to enjoy the timeless holiday classics in The Original Christmas Specials Collection: Deluxe Edition featuring 5 unforgettable stories. Produced by the legendary Rankin/Bass, Rudolph the Red-Nosed Reindeer, Santa Claus is Comin’ to Town and The Little Drummer Boy feature iconic Animagic™ stop-motion animation and Frosty the Snowman and Cricket on the Hearth are beautifully illustrated. Starring the voice talents of Fred Astaire, Jimmy Durante, Mickey Rooney, Danny Thomas, Burl Ives and many more, these favorites also feature some of the most beloved songs of the season and are sure to entertain audiences of all ages for generations to come!